of the Critical Latin Edition by the Quaracchi Fathers, of 1882 A. D..
approx weight: 9.1 lbs (4.14 kg). declared co-primary Doctor of the Church, by Pope Sixtus V, on March 14, 1588. S.O.S.M., Inc., is offering 1 copy of this book, as a gift, for a suggested donation of $ 80.00 USD towards the support of its effort to diffuse the knowledge of the teaching of the Franciscan Doctor, St. Bonaventure, and of his Scholastic Theology & Philosophy. S.O.S.M., Inc., ships domestically by Medial Mail (2-8 business days), internationally by Priority Mail (varies 3 days to 3 weeks, depending upon country). and we can do nothing to lessen them, on account of the weight of the parcel. 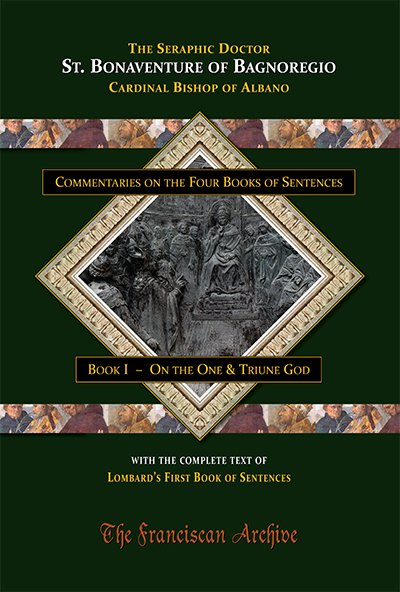 S.O.S.M., Inc., is offering, as a gift, 5 copies of this book, in one carton, for a suggested donation of $300.00 USD towards the support of its effort to diffuse the knowledge of the teaching of the Franciscan Doctor, St. Bonaventure and of his Scholastic Theology & Philosophy. S.O.S.M., Inc., ships domestically by Medial Mail (2-8 business days), internationally by Priority Mail (varies 5 days to 3 weeks, depending upon country). You can acquire a box of 5 copies, in this manner, either Online, by PayPal, or by surface mail (check, money order, or bank check) using this order form (PDF). and only considers offers under the terms of a prepaid orders.